Towing capacity of a car is the total weight your vehicle can pull. The variables that help determine the overall towing capacity are the motor, transmission, brakes, axle and edge. Obviously, each vehicle is built and designed differently. The towing capacity also depends on the size and weight of the vehicle you are attempting to haul with your vehicle. It’s very important to understand the towing capacity before you head out to the highways. Your brakes might not be as effective if the load capacity is beyond limit, rendering it extremely difficult to make sharp turns. Each vehicle is accordingly fitted with a unique compliance certification label. You will find this label on the driver’s door sill area. The stickers will typically read GVW (Gross Vehicle Weight), GCW (Gross Combination Weight), GAW (Gross Axle Weight) and GVWR (Gross Vehicle Weight Rating). Always check your vehicle owner’s manual to get a better in depth understanding of how much weight your vehicle can handle. You should generally leave a little leeway and never exceed the given capacity of your vehicle. Double check the tires of your vehicle to prevent sudden skidding or swerving. Once you’ve determined the towing capacity of your vehicle, you can then plan out your trip. Make sure you have a sturdy tow dolly to support the weight of the vehicle in which you wish to have towed. The next step is to safely secure the vehicle in place to prevent it from sliding off and causing serious accidents. Pay very close attention to speed signs while pulling out to the highways. You are also required to drive in the right lane, which is specifically designated for towing purposes. Check your local city towing regulations as well. 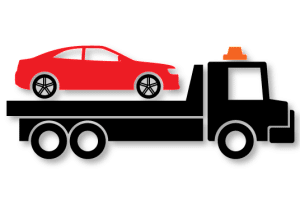 There are a couple different reasons your vehicle may need to be towed. Maybe you’ve had an accident or maybe your car has mysteriously broken down on the highway. Regardless of the reason, it’s important to know who you’re going to call in case of a vehicle emergency and to know the proper safety measures you as a driver should be taking and the precautions the heavy towing specialist needs to be taking. For a driver who is mid driving and needs to pull over and have their car towed, there are a couple of important things to remember. In the event of a heavy towing, drivers need to first move their car as far away as they can from other moving cars. If there is a shoulder, great. Move onto the shoulder as soon as you can and cling to its very edge. As you wait for the heavy towing company to come, make sure your hazard lights are on, especially if it’s dark out, so that you are easily visible to other drivers on the road, and easily identifiable for the towing company. If you have an emergency roadside kit in your car, take out any reflectors you may have in it and place them around the outside of your car. To expedite the towing process and better ensure its safety, tow truck drivers are also asked to always be making sure their truck’s cable lines are not at all damaged. Tow truck drivers must also ensure that the truck they are driving is capable of hauling the vehicle that is stranded. This type of information will be made sure of over the phone when the driver of the vehicle first calls. Tow truck drivers are also trained to not unwind the cables all of the way when loading a vehicle, and that the wheel-lift is extended far enough after loading, so that turns are easy to make. Lastly, tow truck drivers are practiced to avoid electrical lines and to ask bystanders to please step back during the towing process. It’s a process that requires a lot of safety attention, but these professionals are all thoroughly trained. From time to time, residents of the New York City area may encounter bad weather when driving. Because many drivers don’t spend time learning how to drive in bad weather, accidents happen that could otherwise be prevented. Therefore it is important to take the time to know what to do when the weather is bad and you get behind the wheel. First you should always be prepared. You should always carry certain things in your vehicle in case you may need them. For example, you may wish to keep a rain coat, an umbrella, and an extra pair of gloves in the trunk. You never know when you may have to change a tire in a downpour! Also keep a flashlight in the vehicle, what if you need to change a tire in the middle of the night on some lonesome highway? Keep your gas tank above the halfway mark, it reduces the risk that you could accidentally run out of gas. Don’t forget the jumper cables, its not fun when your battery dies out but it’s worse when you don’t have what you need to solve the problem. Make sure you have the correct tire iron for your car, a jack, and a properly inflated spare tire. Additionally, if winter is coming, you should have a qualified mechanic inspect your car just to be sure things are working fine. If there are problems, you can get them fixed before cold weather, snow, and ice hit. By being prepared, you can save yourself time and money from having your vehicle break down. When bad weather hits, whether it’s a massive rainstorm, a snowstorm, or there’s ice on the road, it pays to slow down. Driving at a reduced speed can increase the chances that you will have time to react in the event of a possible accident. 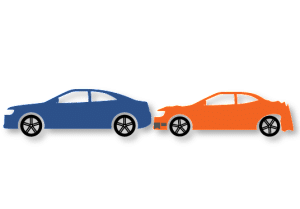 Additionally, if you slow down and keep space in between you and other vehicles on the road, if they slam on their brakes, you will be less likely to plow into the back of them. If the roads are slippery, you should not only drive slower than you usually do, you should also apply the brakes lightly. The New Speed Limit in NYC is 25 M.P.H. Speeding & Speed Limit Laws in NYC are being enforced now more than ever. The new maximum speed is reduced from 30 mph to 25 mph and applies to about 90% of the streets—essentially to all roads where there are no speed-limit signs. A lowered default speed limit won’t affect highways or thoroughfares that have posted speed limits, such as West Street in Manhattan, Fort Hamilton Parkway in Brooklyn and Hylan Boulevard on Staten Island. 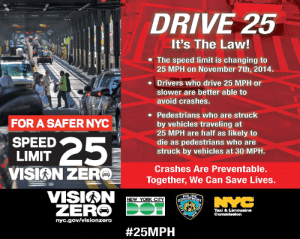 City transportation workers have prepared to hang the first batch of new 25 mph signs at gateways such as the Holland Tunnel and George Washington Bridge—all part of Mayor Bill de Blasio ’s Vision Zero campaign to improve traffic safety and end pedestrian deaths. It remains to be seen whether the city’s always-in-a-hurry drivers will ease off the gas. Mr. De Blasio and other city officials were optimistic the new measure would work.“There’s a real consensus in this town that we need to have people drive more carefully, more safely and slower for the protection of our kids, our seniors,” the mayor said. City police say they have stepped up enforcement this year. The New York Police Department has issued 94,677 speeding tickets as of Oct. 24, up 37% from 69,032 by the same time last year. The city’s Department of Transportation, meanwhile, has deployed 25 speed-enforcement cameras near schools and plans to have 140 in place by the end of 2015. The agency is allowed to use the cameras only when school is in session. “It’s not our goal to try and play gotcha. It’s our goal to make the streets safer,” said Polly Trottenberg, the city’s transportation commissioner. Besides taming unsafe driving, Vision Zero would result in the redesign of New York City’s streets and intersections deemed dangerous for pedestrians. To date 111 pedestrians have died on the city’s thoroughfares, down from 134 deaths at the same point last year, a Department of Transportation spokeswoman said. To draw attention to the new speed limit, city transportation officials invited reporters and news photographers to the city’s shop in Queens where workers produce speed-limit, street-cleaning and other signs. When it comes to the correct steps in battling against vehicle fires, having a fire extinguisher handy is the first rule of thumb to follow. Safety fire extinguisher should be your number one priority before heading on your family trip. This will be your number one line of fire defense before the fire officials arrive in case of a fire. It is a good idea to have at least two fire extinguishers in your vehicle. There are five elements that are present when a fire occurs: oxygen, heat, fuel, and some type of chemical reaction. All of these five elements form what is known as the fire triangle. Once the fire triangle is identified then the fire can be eradicated by either taking away or isolating any one of those elements of the triangle from all the rest of the elements in order to prevent a vehicle fire. Today’s market offers various types of safety fire extinguishers. It is very important that you use the accurate fire extinguisher when trying to put out a fire. If you use the incorrect type of fire extinguisher there may be a problem trying to diminish the fire therefore making the extinguisher ineffective. As a matter of fact using the wrong type of conformity can cause the fire to reignite after seemingly putting out the fire. Make sure you do your research before purchasing a safety fire extinguisher, since most suppliers are ignorant to the suitable types of fire extinguishers for your vehicle; it is diplomatic to do a thorough check on your extinguishers in your vehicle. When classifying the types of fires there are three categories they fall up under. The first class is called a Class A fire; these fires are mostly caused by burning wood, paper, cloth, plastics etc. The second class of fires is called Class K fires. These types of fires normally originate in the kitchen; they involve cooking oil, vegetable fats and animal fats. The last class of fires is called Class C fires; these fires occur with electrical equipment such as motors, transformers and other appliances. The recommended fire extinguisher for vehicles is called a Dry chemical extinguisher. It works efficiently on Class A as well as Class C fires. The way it extinguishes the fire is simply by doing away with the chemical reaction part of the Fire triangle. This extinguisher creates a barricade in between the oxygen and the combustible elements of a Class A fire. Another type of safety fire extinguisher available on the market is a Water mist extinguisher which is mainly for wood, paper, or cloth fires; however it is also effective as well as safer for use on Class C fires. It eliminates the heat portion of the triangle. Next there is a Cartridge operated dry chemical extinguisher. These types of extinguisher are very pocket-friendly for small to mid-size fires in the home. Nonetheless there are other types available that can only be used for specific fires. These models include water and foam extinguishers; these are only effective when used on a Class A fire. It should never be used on Class C fires which involve electrical equipment and cause someone to be electrocuted. Also Carbon dioxide extinguishers, which can be used for Class C fires (i.e. electrical). These are just a few of the many products offered to protect your home. Remember a fire extinguisher should be preserved in accordance with the relevant local rules. There are so many things that can go wrong while driving; overheating is a big one. 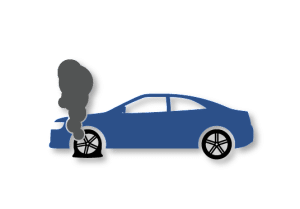 Many factors can cause a car to overheat. The most common cause for engine overheating is simply low coolant (anti-freeze) during warm temperatures. Your engine’s cooling system relies on coolant to circulate and remove heat from the engine. If you don’t have enough coolant in there to do the job, heat will build up and your engine will overheat. Another reason why your car may overheat is malfunctioning of one of the electric cooling fans. If you have an electric cooling fan that isn’t coming on, this can cause your engine to overheat. The electric cooling fan draws cooler air through your radiator. Pull over to a safe location and turn off the engine. Do not open the hood until the car has completely cooled or the temperature gauge has moved from hot to cool. Check the coolant (also called antifreeze) level in the radiator. Look in the owner’s manual if you are unsure where the coolant tank is. Make sure the radiator cap is cool before opening it. Slowly twist it off with a towel and beware of any hot steam. If needed, fill coolant to the top of the radiator. Put the radiator cap back on. 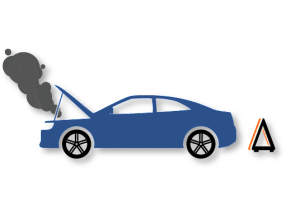 Be sure the upper or lower radiator hose and any of the heater hoses have not been blocked, disconnected or burst. Carefully monitor the temperature gauge. If you see it crossing the optimal mark, pull over to a safe location and turn the engine off. While your best bet is to get help from a mechanic, your safest bet is to be prepared. Store these essential items in your car: Coolant, tool kit, working flashlight, non-perishable foods and water.